The academic teams in the centre have been experimenting with a range of techniques to further enhance this. In this blog post we explore how the use of video and YouTube is helping international students develop core mathematical skills. While innovation in teaching and learning may not always be framed within the lexicon of the flipped classroom, there is solid evidence of flipped techniques being used to great effect across higher education. It isn’t only English where international students display a wide range of abilities and skills on entry to foundation programmes. Science subjects and Mathematics in particular, can present academic hurdles to some international students who, without regular and sustained support, may under-achieve and risk missing out on progression to further study. Such students on the Physical Sciences & Engineering Foundation Programme at INTO Newcastle University who require further support are given one-to-one or group tuition by teaching staff to help consolidate the scheduled teaching. However, while this is useful to students who attend, such additional sessions are limited because of the demands of the academic timetable on students and staff alike. “At INTO Newcastle University a series of video tutorial sessions have been produced by teaching staff to provide further support in specific areas of the Engineering Mathematics syllabus,” comments Brian Hewitt, Assistant Programme Manager, Science & Engineering and Mathematician. As well as enabling more reticent students to access support which they might otherwise avoid, once recorded, videos prevent teaching staff having to repeat similar sessions for different students. In this way, a student can access general support through a relevant video and teaching staff can then focus further specific support as required. Great article. As an EAP tutor, I’m finding that embedding video content in course delivery is becoming a foundational element in my practice. Although there is not the quantity and quality of content to deliver truly flipped sessions, if relevant and appropriate, it can be used to engage students at the beginning of a session or to present input or target language. It can also be used in skills development, for example, note-taking. 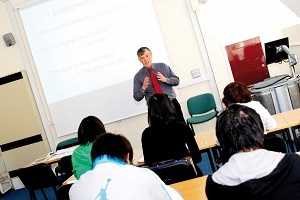 In forward-thinking teaching departments, filming sessions is commonplace and can be used for INSET or as flipped content on a CELTA or DELTA course.